A climate-friendly way to produce hydrocarbons from carbon dioxide extracted from bioethanol manufacturing and from hydrogen generated by water electrolysis has undergone successful piloting, as per reports in Finnish scientists. The pilot started in October and ran for almost five weeks at the biorefinery in Jokioinen, Finland, of St1, Gothenburg, Sweden. The 10,000-L/yr refinery uses liquid starch from enzyme production as its main feedstock and produces liquid animal feed, soil improvers, fertilizers, and carbon dioxide. A proton exchange membrane (PEM) generated 4 Nm3/hr of hydrogen for the pilot. 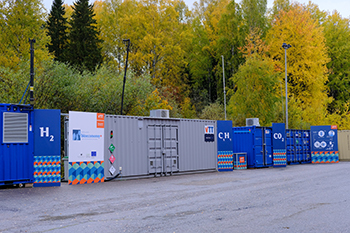 The PEM contains 12 electrolyzer cells operating at 65–70°C, all housed inside a 10-ft-square, 5-mt container producing hydrogen. This is then passed into a Fischer-Tropsch synthesis unit which consumes 2 Nm3/hr of carbon dioxide from the ethanol plant and produces 3–5 L/d of liquid hydrocarbons and 6–9 L/d of solid hydrocarbons. The product breakdown consisted roughly of 20% hydrocarbon gases (C1–C4); 25% gasoline fraction (C5–C12); 15% diesel fraction (C13–C18); 40% heavier fraction (C18+), mainly waxes; plus small amounts of n-alcohols and olefins. The pilot has shown that the process integration was successful and that carbon dioxide utilization is possible in this way. The whole process resides within a mobile synthesis unit. However, due to an unfortunate technical accident, the demonstration was cancelled prematurely as the synthesis unit was damaged. This accident does not reflect the core technology development itself, as this was due to some design faults that can be taken care of in future activities. The plan now is to build a next-generation synthesis system on the same scale as the damaged pilot plant.